Government, Trustees, and Council should hang their heads in shame for repeatedly turning a blind eye to the continued reprehensible behaviour of the Melbourne Racing Club. We know that the Department, Council, and the Police were inundated with complaints from residents near and far over the recent ‘rave’ concert at the racecourse. 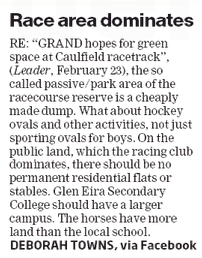 And not a word (of course) from Glen Eira City Council nor its trustee representatives. not defending the council but you can see it is actually in the council minutes that they are preparing a report. Basically the buck stops with Lisa Neville. The fact that Stonnington residents have been disturbed might mean they will do something about it. I find it interesting that residents have no rights but promoters of a rave which seems to be only for the purposes of consuming illicit drugs are tolerated. We now have a week of outdoor cinema to look forward too. Another f**king report!!!! Don’t hold your breath while you wait for something of significance to be produced.. 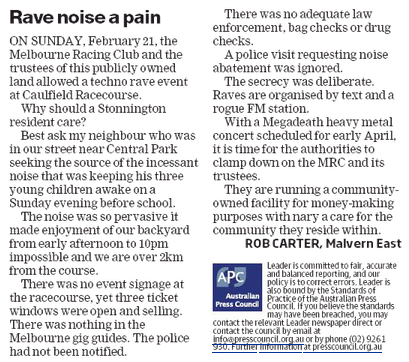 Try searching Caulfield Racecourse rave party march. I think it comes up. There were two “raves” (a.k.a. outdoor electronic dance music festivals) held on that weekend ie. Saturday (20/2 “Dekmantel”) and Sunday (21/2 ‘Electronic Dreams’) with both events running from 12 noon to 10 p.m. The preliminary sound checks and patrons departure/clean up adds at least another hour to both ends of these times.
. enables the mixing or blending of tracks together seemlessly, hence, unlike live concerts, there is no break in the sound. So for at 11-12 hours there is no let up in the powerful throbbing base. As a suffering resident, let me assure you that it doesn’t take long before the constant throbbing gets to you (2 hours max) and makes any outdoor activity on your property or in the Racecourse park intolerable. Both the Trustees and responsible government department were savaged by the Auditor General (Sept. 2014) for their abject abject failure to prevent the MRC dominating the 54 ha of crown land that has 3 separate yet equal purposes ie. racecourse, public park and public recreation ground. I believe his actual words were that continuing with current management practices was “untenable”. Almost 18 months on from that report and NOTHING has changed from the public perspective. Who can blame the MRC for capitalising 54ha of prime public land valued at $2bn for a paltry $190K annual rental (for 12 ha only, the rest is free) when clearly the Government is happy to turn a blind eye. He continues to lie through his teeth. There hasn’t been a consultation process—LXRA is still trying to repair damage done by the Premier. The gas pipeline can be moved if the government wanted to, but it would delay the project. The project itself is a political promise so regardless of technical issues and regardless of consultation and regardless of the need for proper planning, the Premier has to maintain his fantasy that all is well. Both Kevin “no compensation” Devlin and Daniel “STFU” Andrews are liabilities to the project. BTW LXRA today confirmed that it is their intention to have changes made to our Planning Scheme via ministerial intervention: no notice, just a fait accompli. Yes, community consultation may have been better. But I am very pleased that the Andrews Government is rapidly implementing their policy of removing level crossings in the most effective way that is possible. To suggest that there were no studies for removal of level crossings, since the programmed removal of ALL was stopped in 1970’s is sheer non-sense. To suggest that Labor or Liberal Governments of the past did not take advise from professionals and the public since 1970’s is simply disingenuous and untrue. There was plenty of evidence, forums, submissions, consultations around both Frankston line and Dandenong line. There was plenty of talk but no action. Enough of YAPPING. Action what we need quickly. Glen Eira is the best example of how well the Andrews Government is doing its job in regards to the removal of level crossings. They came in and accelerated the implementation of North Rd, McKinnon Rd, and Centre Rd crossings. Dorothy Ave bridge at EE Gun Reserve was to be lowered, thereby cutting the car crossing from Oakleigh Rd to Dorothy Ave. After consultation with residents and sporting groups it went back for redesign, so that the car crossing now remains open. The Dandenong line design is now being finalised and hopefully fully implemented by the end of 2018, with Glen Eira getting probably the best deal it ever had from any State Government. While Ormond to Bentleigh rail has gone under the road, the Grange Rd to Hughesdale is going with a SkyRail. Why? Because like with any infrastructure development it is ‘horses for courses’. What is best in one area may not be best in another area. There is no such thing as one solution fits all. But, there is more level crossings to be removed in Glen Eira, after the 50 level crossings being planned and/or implemented at the moment. They are, 2 level crossings in Glen Huntly (Glenhuntly Rd and Neerim Rd), and one in Ripponlea on Glen Eira Rd. I do not expect all of the level crossings to be of the same kind. Ripponlea is likely to be a trench rail, because Hotham St and Elsternwick station are in a trench already. And although Balaclava Station is on embankment, it will probably be still cheaper to have a trench rail at Ripponlea. On the other hand Glenhuntly Rd and Neerim Rd crossings should have a SkyRail. It’s just NO BRAINER. The EE Gun Reserve bridge is on an embankment, and so is the lead up to Caulfield Station. The embankments and the rail tracks are always a disgrace, because they are not being properly taken care of. To get trenches under roads and tramways would be much, much more expensive than constructing a SkyRail. There is also the issue that with SkyRail 3km under the SkyRail becomes available for Open Space or Community Space or Car Parking in such a ‘hungry’ for such spaces area. Jut right now the Woolworth car park areas was reduced from 3 hours to 2 hours. Ask anyone trying to park in Glen Huntly now and they will be screaming ‘blue murder’. What a fantastic political wedge this SkyRail vs SkyScrapers issue develops into. Yes, what would you prefer a 9m SkyRail or a 12 storey or 40m building with TrenchRail cover and SkyScraper. I heard for few years now that Ormond and McKinnon stations and land in-between may be developed using the trench and cover method, while the developers are given the right to develop high-rise apartment buildings as per http://www.smh.com.au/national/hong-kong-rail-operator-mtr-corporation-seeks-to-strengthen-presence-in-sydney-and-melbourne-20151215-glo3b8.html . My inner cynic tells me that the current Labor Government is happy to continue with the Libs arrangements and selling off the VicTrack land, collect the ‘boot’ and then blame Libs for any problems in Bentleigh electorate. The ‘boot’ would be used then for removal of extra level crossings. The SkyRail on the other hand should enhance the Labor chances in the Oakleigh electorate. So, that leaves only the Caulfield electorate with Libs David Southwick being wedged by this issue. Of course, he has aligned himself very strongly with the No SkyRail people, since they criticise strongly the Labor and receive plenty of media. And with the local elections coming this year the SkyRail vs SkyScrapers may also become an issue people may take into account. Some of our Councillors have already determined to oppose SkyRail outright. i think some people will be changing their allegiances depending on how it affects them personally. What a fascinating issue. I know already how the No More Train Trenches and the Carnegie Resident will be voting. I will be an amused observer and a critical reporter. •What permits and permissions did the operator require and from whom? •Did the operator have all required permits and permissions? •What conditions or constraints were placed on those permits? •Did the operator comply with those conditions? •Did the operator comply with SEPP N-2? •Does SEPP N-2 adequately cover the situation?